As I discuss in considerable detail in Dogs, Dog Food, and Dogma, there is near-universal acceptance among the mainstream veterinary nutritional “authorities” (the handful of board-certified veterinary nutritionists and countless self-appointed experts) that “a calorie is a calorie” and that carbohydrates are not uniquely fattening for dogs and cats. 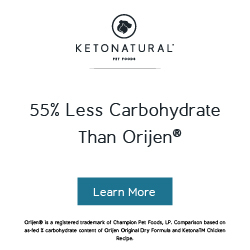 This despite the inconvenient truths that (1) there are at least six recent peer-reviewed studies in which carbs have been shown to fatten dogs and cats considerably more than other nutrients and (2) there is a clean, sensible, well-understood sub-cellular biochemical process by which carbs have been shown to do their uniquely fattening work. The reasons for the veterinary community’s reluctance to accept the bad news about carbs are discussed in my book (spoiler alert: big business interests are involved). They need not be rehashed here. If suffices to say that there isn’t a single veterinary nutrition textbook in which you’ll find a discussion of why carbs are to blame for the canine obesity epidemic. Trust me, I’ve read them all. But, if you look carefully, you’ll find that those books do make an admission of sorts about the role carbs play in another epidemic-level health problem killing America’s dogs. As I’ve discussed previously, there is a growing community of research scientists who believe that carbohydrates play an important role in the rapid, abnormal cell growth that we call cancer. That, because glucose is the only fuel source potent enough to power the furious growth of renegade cancer cells, and because carbohydrate intake is the primary driver of blood glucose levels, if you cut out the carbs you can effectively shut down tumor growth. While this line of thinking is far from mainstream among oncologists who treat human patients, it seems to have found broad acceptance among their veterinary equivalents. Because the leading veterinary nutrition textbooks all highlight how and why cancer-stricken dogs should be “deprived” of dietary carbs. “Carbohydrate metabolism is dramatically altered in dogs with cancer,” the authors of Small Animal Clinical Nutrition report. More specifically, as they put it, “tumors preferentially metabolize glucose for energy.” The other books highlight this well-documented reality in more or less the same way: carbs beget glucose, and glucose begets tumors. And what’s the recommended nutritional intervention to deal with this metabolic reality? The obvious one: cut out the carbs. In other words, even if you prefer to float the mainstream when it comes to your nutrition advice, there’s a damn good reason to minimize the role that carbohydrates play in your best friend’s diet: it will probably reduce her risk of falling victim to cancer, the leading killer of dogs in America today.